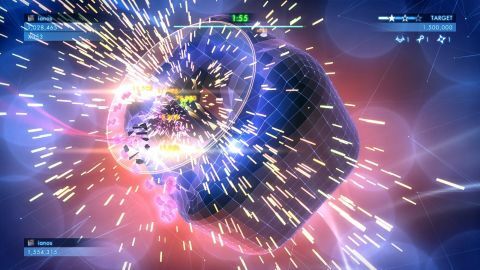 A double-comeback of sorts, Geometry Wars 3: Dimensions sees the return of the twin-stick shooter series after six years away. It's also the very first game released under the returning Sierra Entertainment banner. Oh, and it's really good. Merry Christmas! Dimensions is, on the surface, as simple as it gets: fly around, shoot shapes of differing types and behavioural patterns, don't die. That's the basic, brilliant game that will end up eating into your time like you really wouldn't expect it to—unless you've already played Geometry Wars on another format, in which case you know damn well what you're getting yourself into. Dimensions is elevated above its twin-stick siblings by clever design choices, most of which return from the previous two games in the series. Every enemy you blast leaves behind 'geoms' which must be collected to build your score multiplier. You can't get a high score without them, but collecting them means placing yourself on the frontlines, on the attack at all times. Geometry Wars' balance of risk and reward approaches perfection. What initially seems like a bewildering difficulty curve becomes more manageable as Dimensions' basic mechanics become second nature. This process repeats as you get better at the game: odds that seem insurmountable one minute becoming another minor hurdle as you progress in your quest to bag another million on the scoreboard. A quick tap of X (heaven forbid you play Dimensions with anything other than a gamepad) and you instantly restart, ready to start the climb again. The basic modes involve familiar concepts—get the highest score in a set amount of time, get the highest score in one life, get the highest score without being able to shoot, and so on. In this sense, not much has changed for Dimensions. The most notable change affects the levels themselves, which are no longer flat planes. Some stages are now fully three-dimensional objects, which introduces an element of strategy: enemies can sneak up on you by looping around the play area, Asteroids-style. As well as a mild strategic element, these levels also up the visual flair in Dimensions. One minute you're making your way around an explosion-riddled pill shape, the next you're avoiding encroaching Red Walls of Death on an explosion-riddled zoetrope. This change actually caused a bit of motion sickness, personally, particularly as I span around an explosion-riddled cube while chasing a boss. Enemies can sneak up on you by looping around the play area, Asteroids-style. Yes, Dimensions features a campaign mode with boss fights—something that provides structure in a series renowned for its simplicity. This is backed up by a star system, with each of the 50 levels rewarding your performance with one to three shinies. These stars are essential to progress, making the repetition of levels a requirement rather than an option—there's no cruising through, but it's still fun to go back over the short, sharp levels and try to better yourself. At least until you reach those boss fights. They're beatable, but rely on cheap tricks like overwhelming you quickly rather than any kind of design nuance. It's a shame, because Geometry Wars' basic shooty-blastyness suits a more formal framework. The game isn't ruined by these dodgy battles, but they do stink up the place pretty bad—it's one of the few times I felt reticent about replaying a level, whereas before I couldn't hit restart quickly enough. Thankfully, you can ignore all of the new newness, including extra features like helpful AI-controlled drones and secondary special abilities (homing missiles, black holes and so on.) If you like, you can stick Dimensions into classic mode and play the game pretty much as it was ten years ago on Xbox 360. The original Geometry Wars was strong enough that this sequel would score a bit lower without the option to disable everything that has been added since. That's not to say these new elements are bad—it's just a case of the added extras only being there because they have to be. The core game—what Geometry Wars is—is close to pure arcade gaming perfection. Played alone against the ever-changing leaderboards it's captivating and exciting, while played against friends in the same room it's an exercise in hooting and trying your hardest to put the other person off their game. To make them blink. It's just pure, unabashed fun. But it is still a surprise that Geometry Wars 3: Dimensions has turned out as well as it has—this is an unexpected sequel from a relatively-unknown studio, published by a company that has been dead for a decade. If you'd asked anyone at the beginning of the year what sequel they'd want to see on PC, nobody would have sad this. But a formula this potent can survive anything, and comes very much recommended. Just try not to blink.